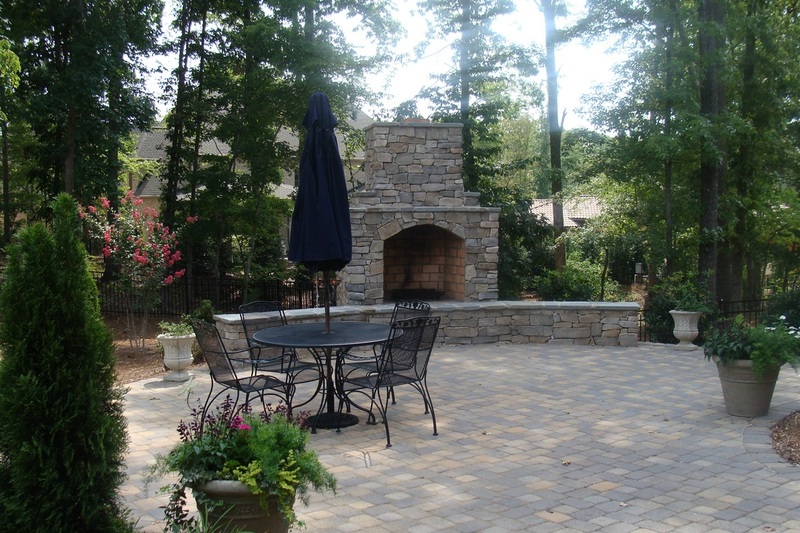 This outdoor living area started with a full length deck across the back of the house and a border of overgrown Leyland Cypress trees on both sides. 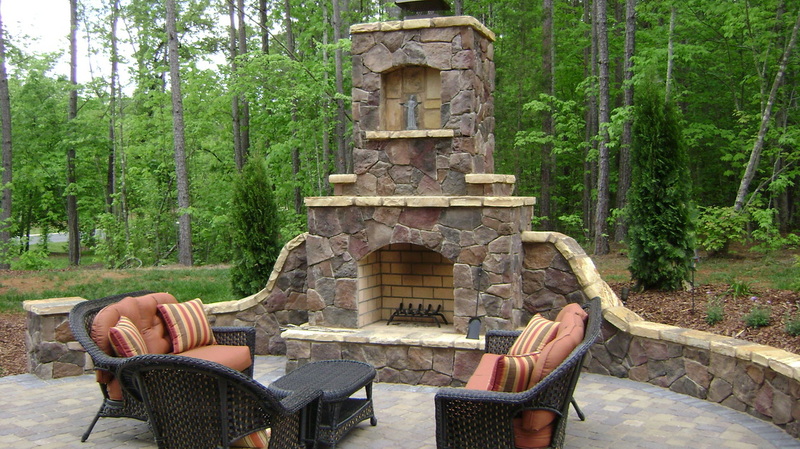 Goal: Create a more functional entertaining space while incorporating several different hardscape aspects. 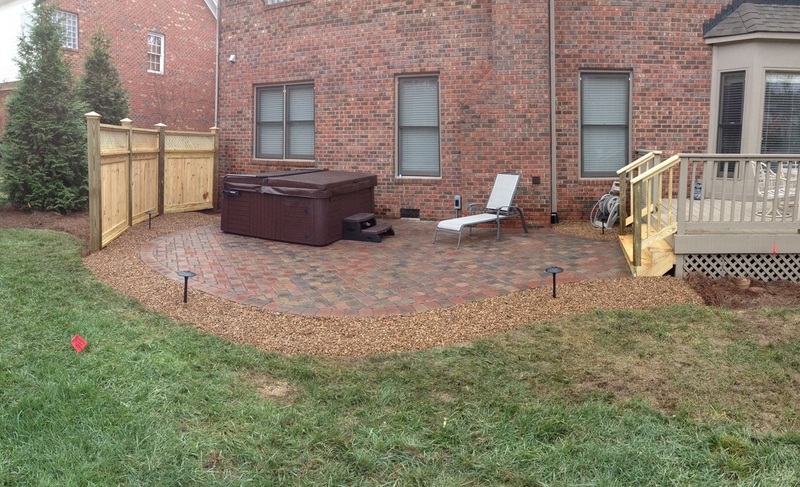 Our space was very limited but we managed to successfully install all of the features requested by the client. 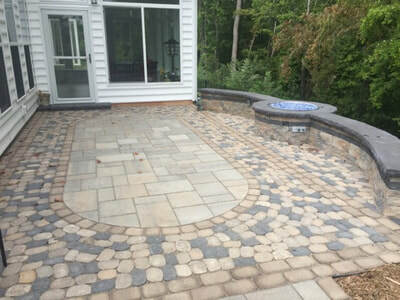 This included: outdoor fireplace with woodboxes, gas fire table, retaining wall, 2 level paver patio, paver walkway, full outdoor kitchen, low voltage LED landscape lighting, drainage system, irrigation system, new planting and sod. A "Before" picture of the project area. 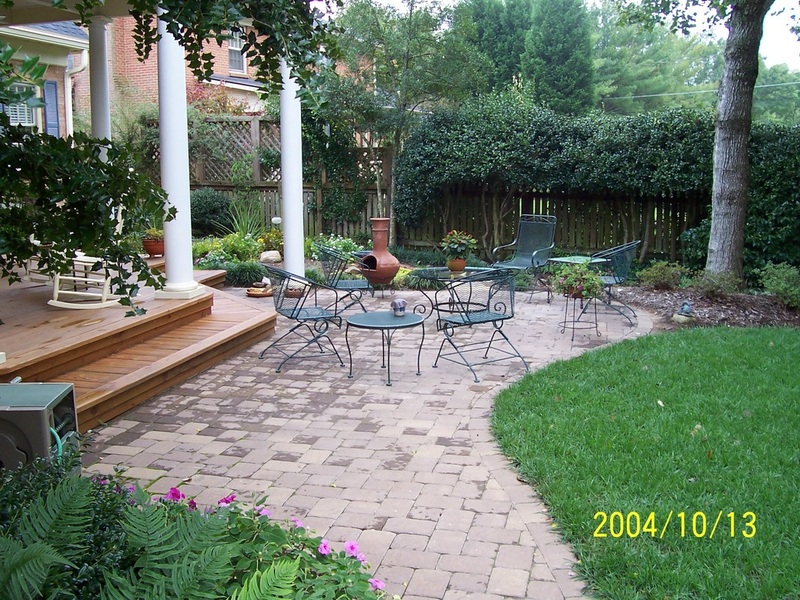 Notice how the existing Leyland Cypress minimized the overall width of the rear yard. 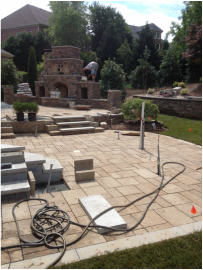 The perimeter shrubs are gone and almost all of the blockwork is finished. 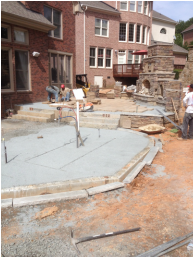 All of the utilities have been installed and there were quite a few! 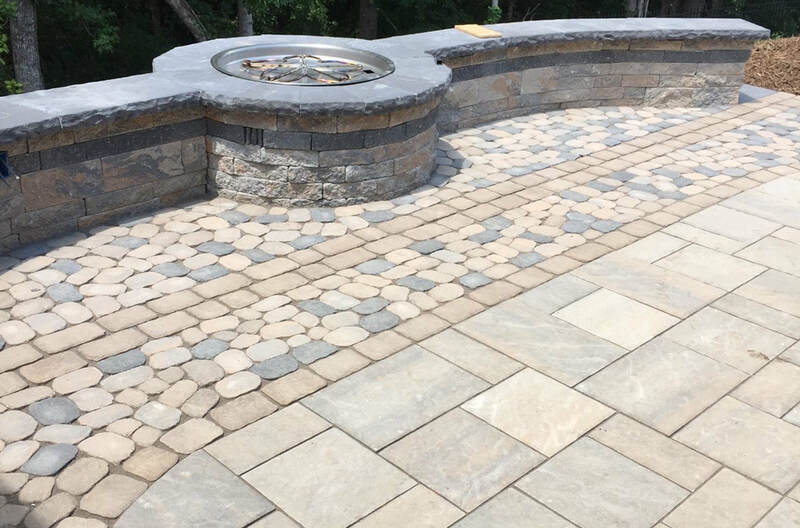 Water and drain lines for the outdoor kitchen, gas lines for the fireplace, grill and gas fire table, electrical & audio / video cables for the TV mounted on the outdoor fireplace. 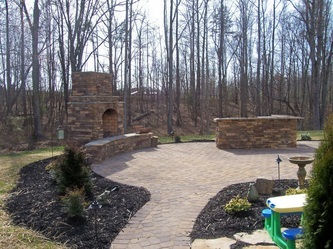 Here's a better view showing the 2 levels of this paver patio and the outdoor fireplace. 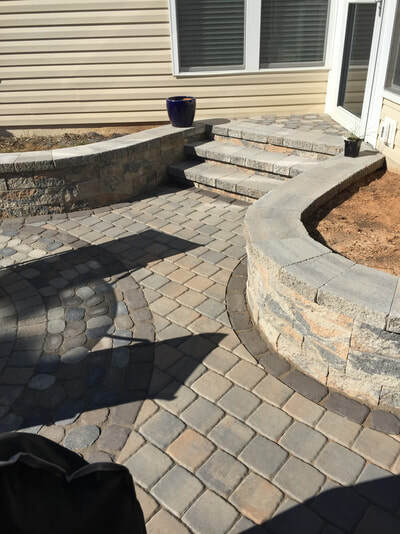 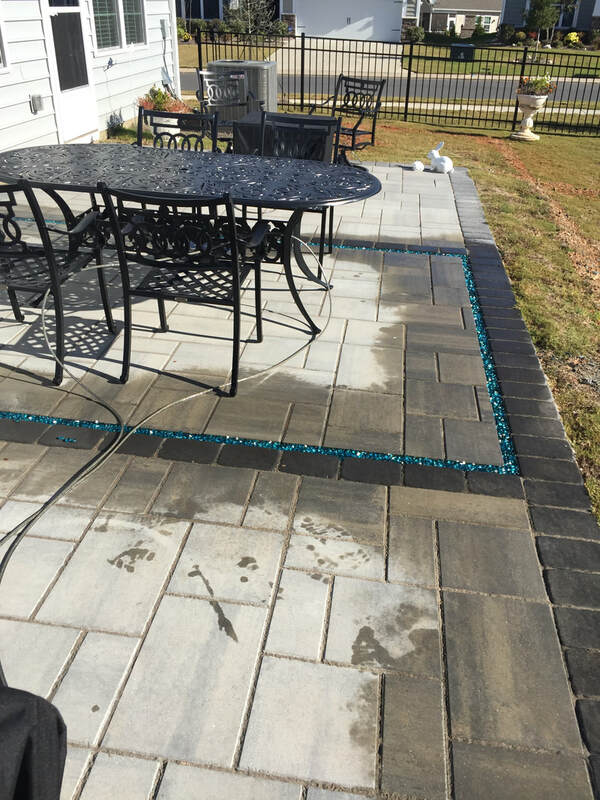 The pavers used on this project were a Techo-Bloc Blu Slate. They're a little dusty in this picture but once we were finished and put a good cleaning on them, they looked totally different. 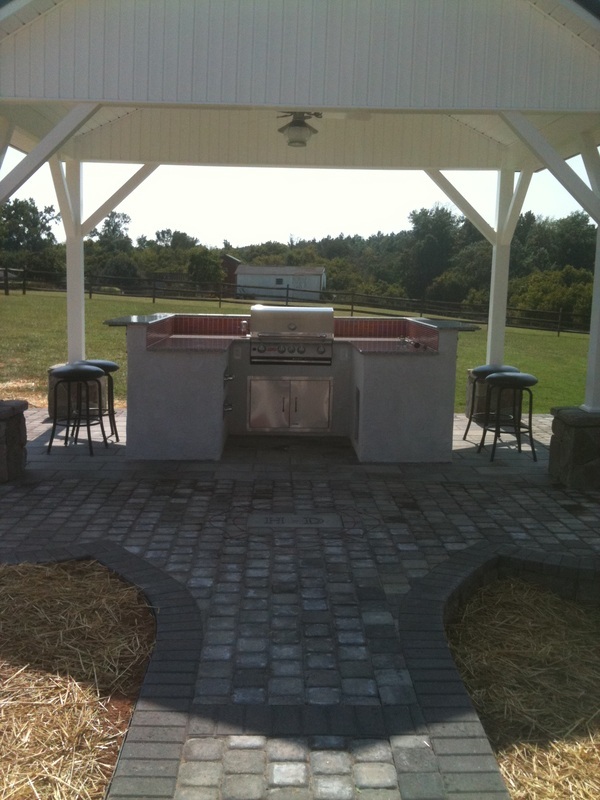 A view of the outdoor kitchen and gas fire table. 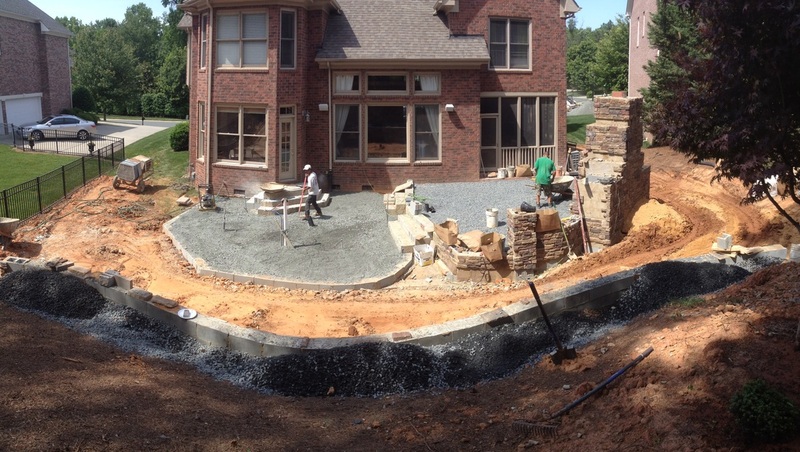 The granite countertops have been installed and now it's time to start installing the appliances. Sod and most of the plantings have been installed as well as the irrigation system. 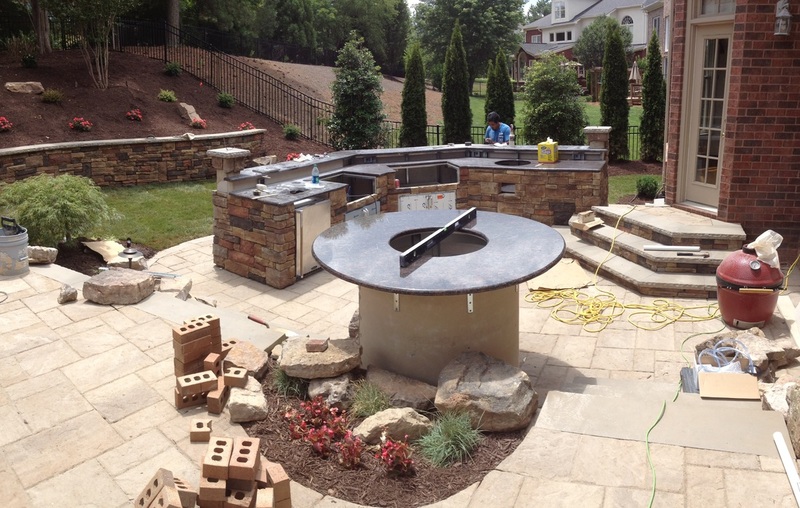 Waiting on the outdoor kitchen island to be "re-made". 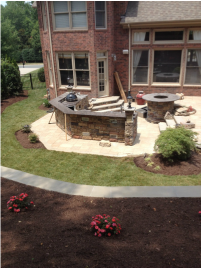 Our schedule was looking good until we got a call from the cabinet manufacturer who informed us that a metal roof beam had fallen the night before and landed on our kitchen island. 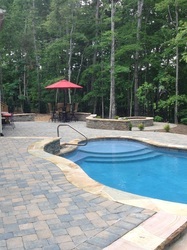 Needless to say, it was a total rebuild but they pulled everyone together and made excellent time to get us a new island. 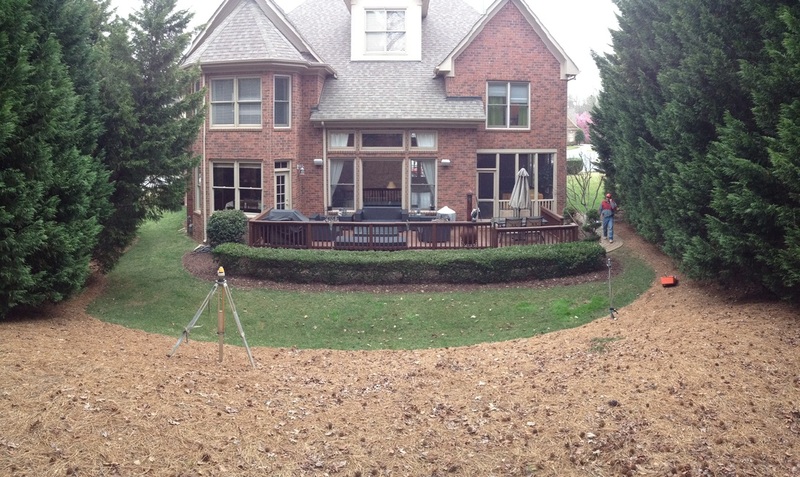 Just a little punch out work to do now!! 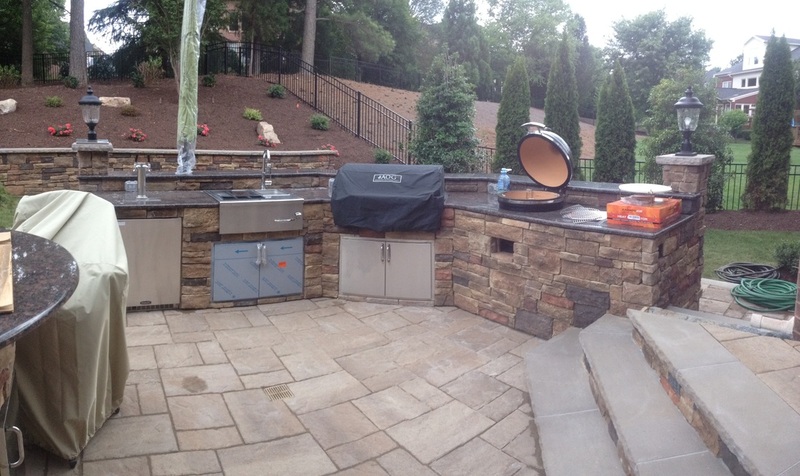 The appliances have been installed, inspected and tested. 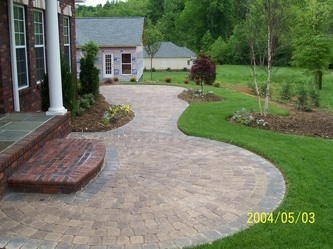 Here's the Techo-Bloc paver walkway and edging blocks leading into the rear yard. 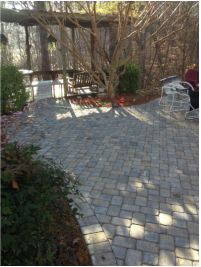 A few low voltage landscape path lights were installed to illuminate the walkway. 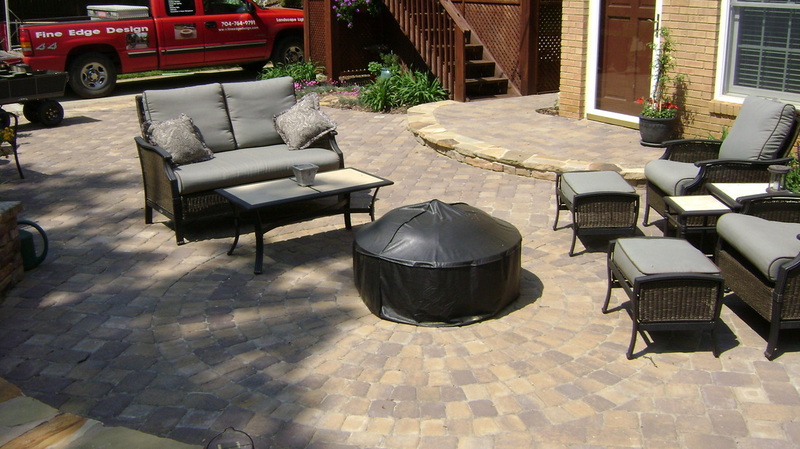 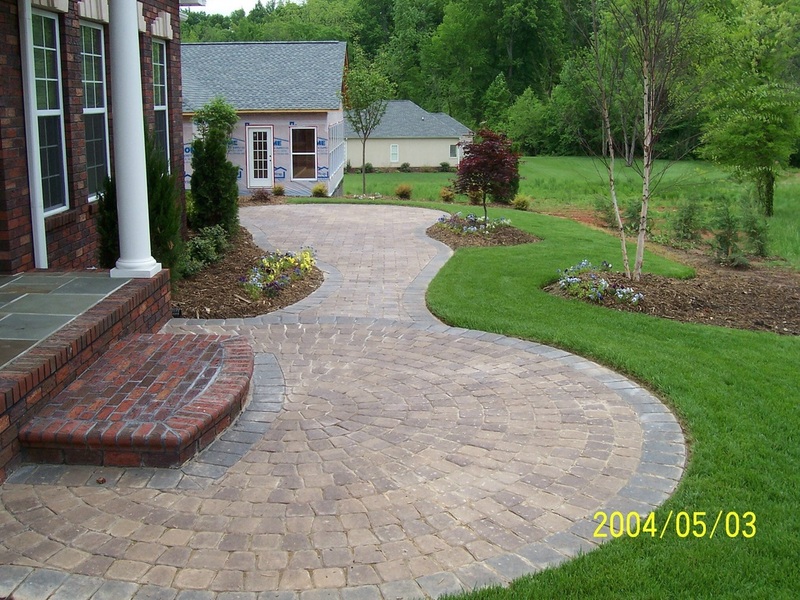 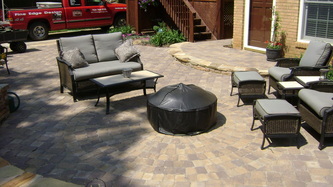 Here are some examples of paver patios using the Techo Bloc brand of concrete pavers. 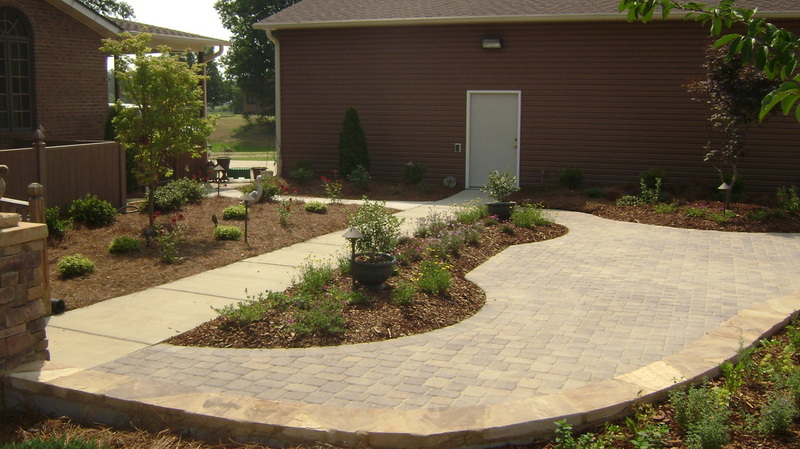 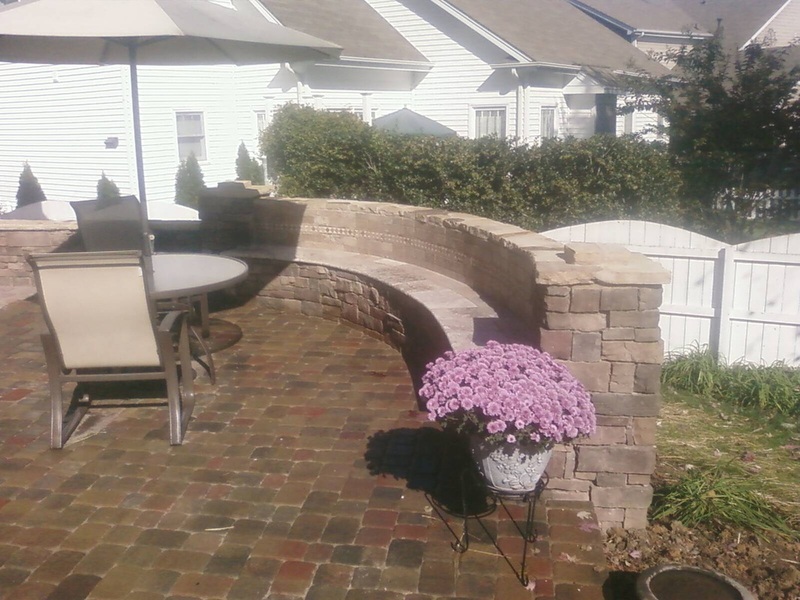 They offer many different styles and colors as well as matching retaining wall systems and edging blocks. 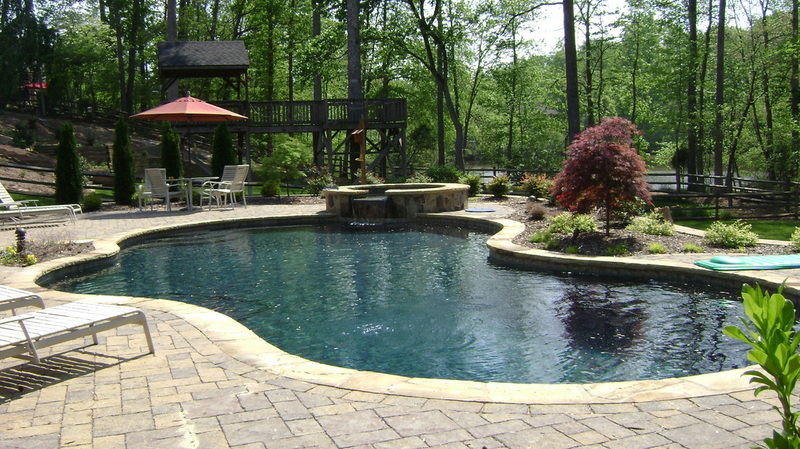 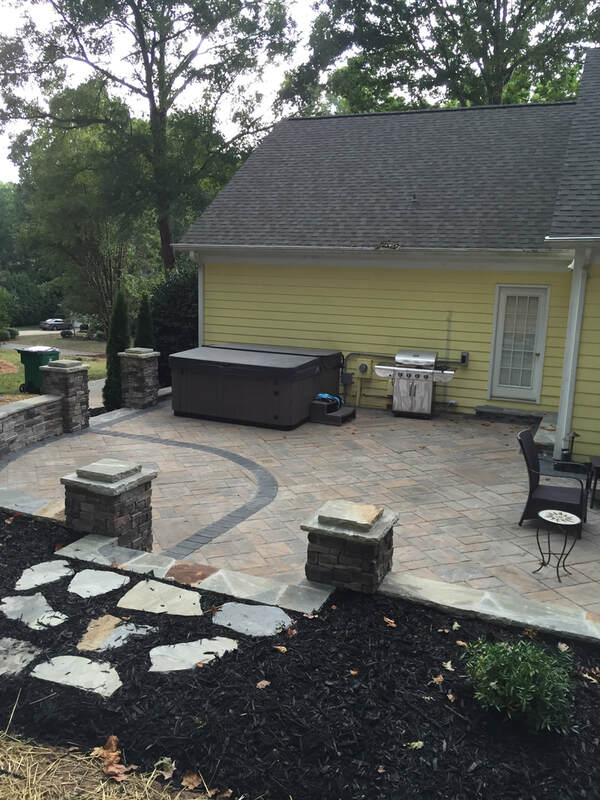 The main purpose of this patio was to create an area for a new hot tub and a couple lounge chairs. 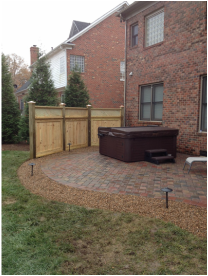 We installed the privacy fence and some LED lighting to complete the paver patio project. 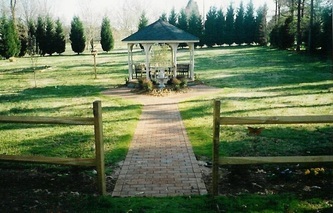 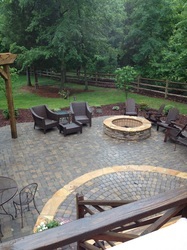 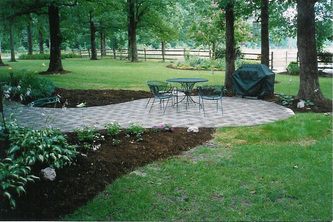 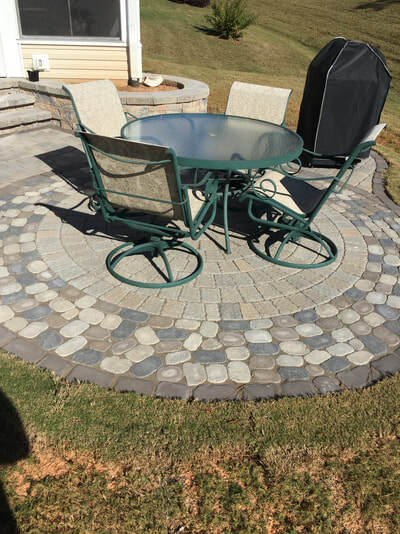 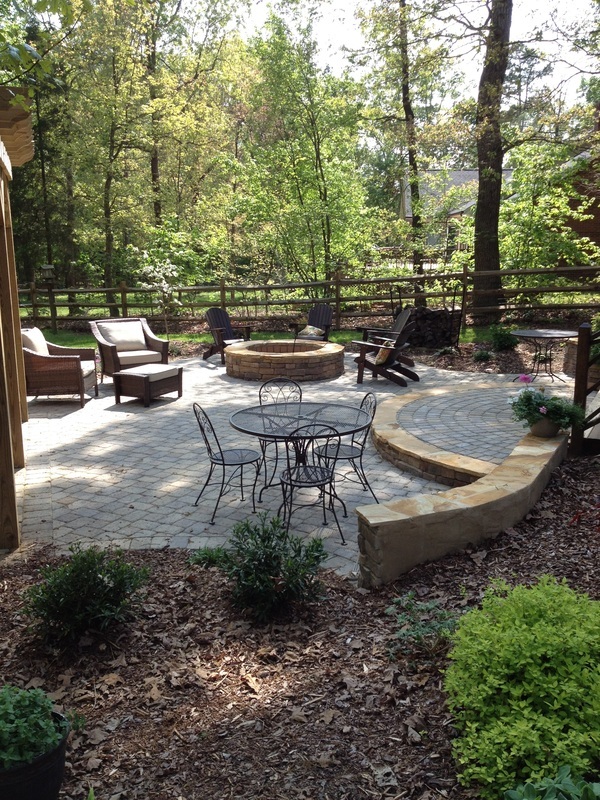 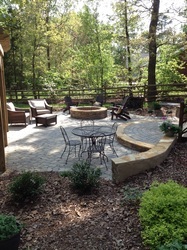 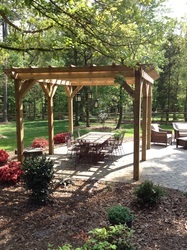 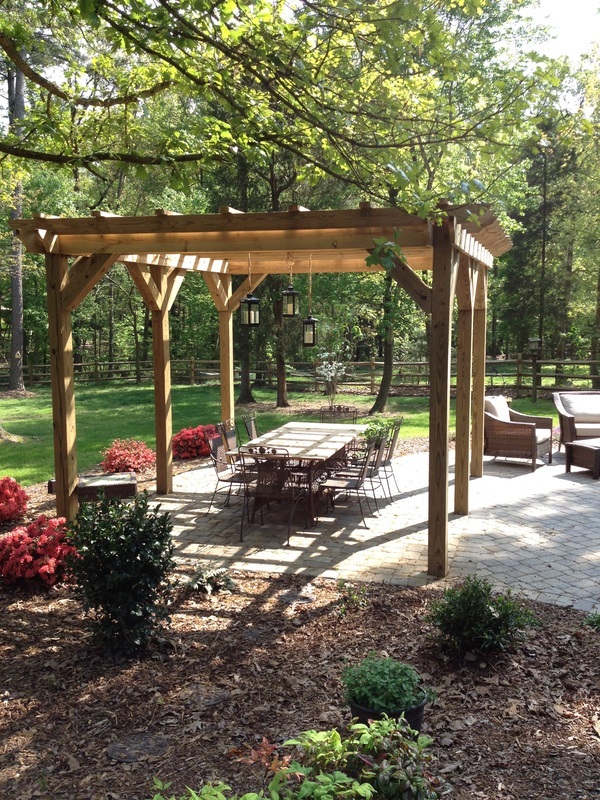 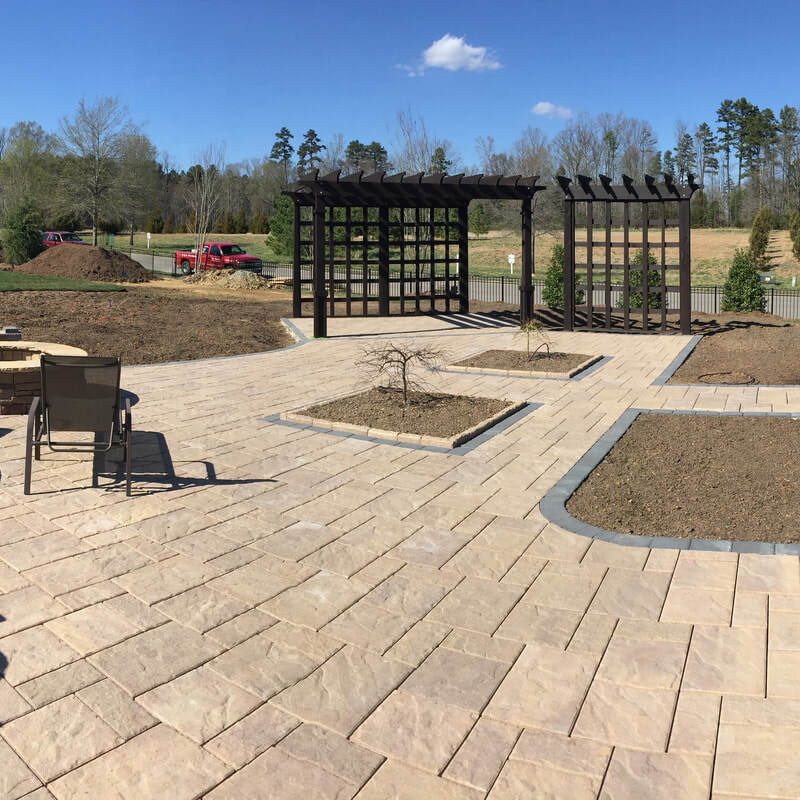 This Waxhaw, NC patio was a big change to the existing gravel path that led to the gazebo. 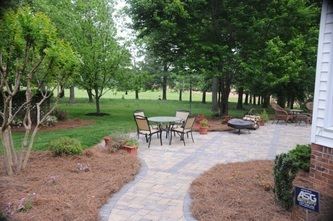 Now this client has plenty of entertaining room and an easily accessible path from the house. 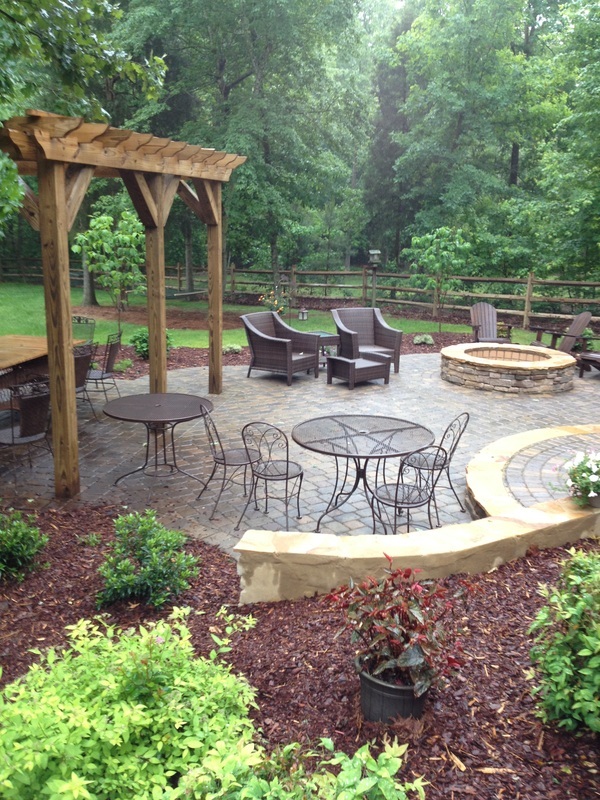 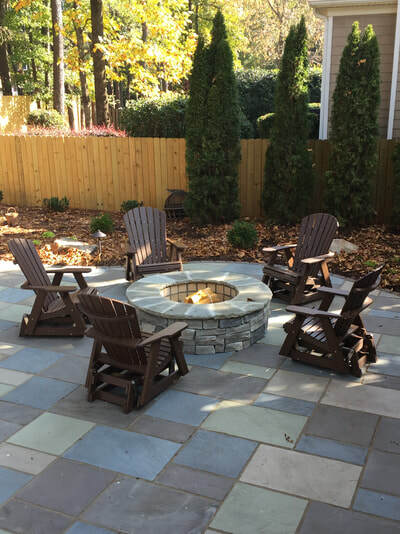 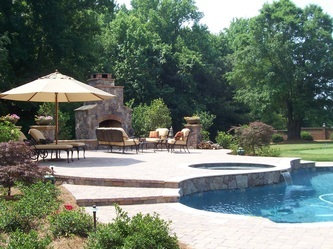 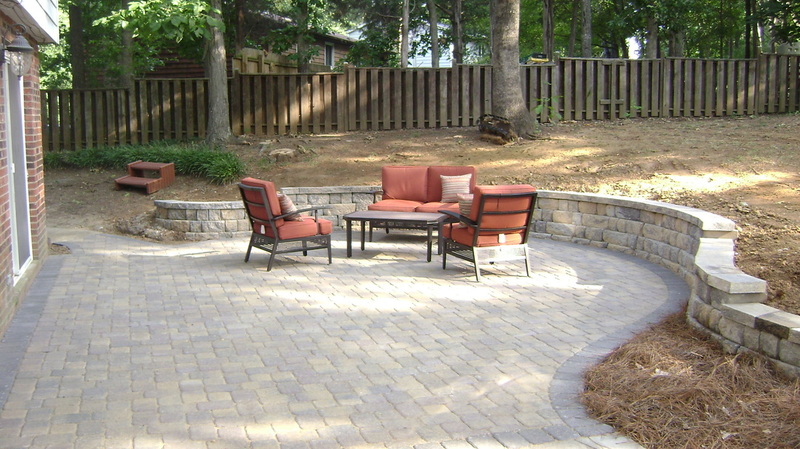 This Waxhaw, NC patio adds plenty of room for a small firepit. 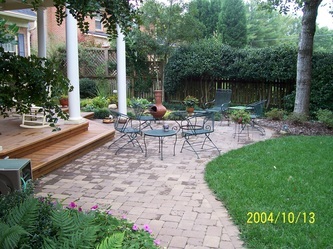 Initially, there was an old wood deck that we removed. 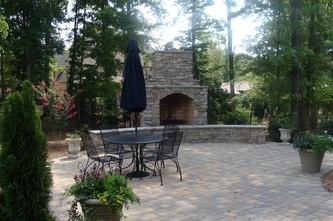 The client wanted a larger entertaining area that included an outdoor fireplace and space for a new hot tub. 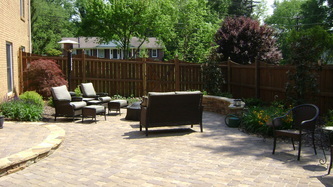 The stone walls and columns further enhance and border the entire paver patio area. 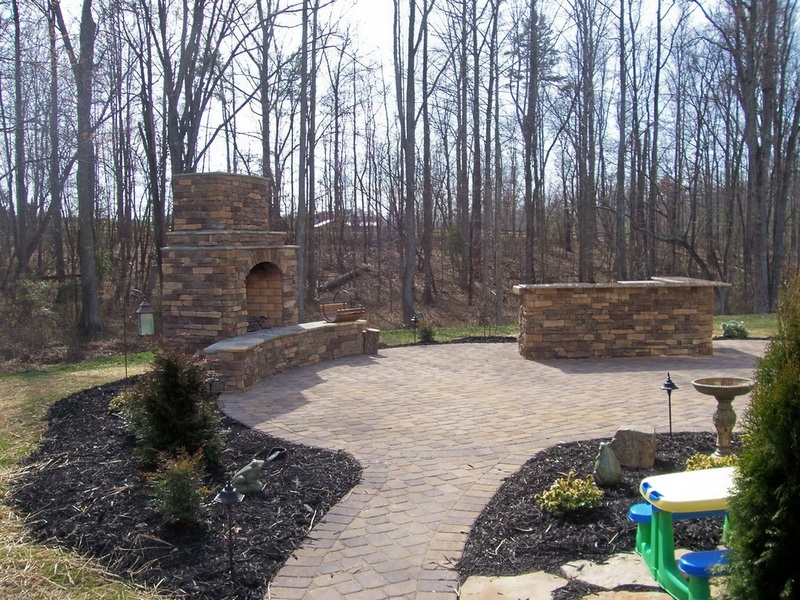 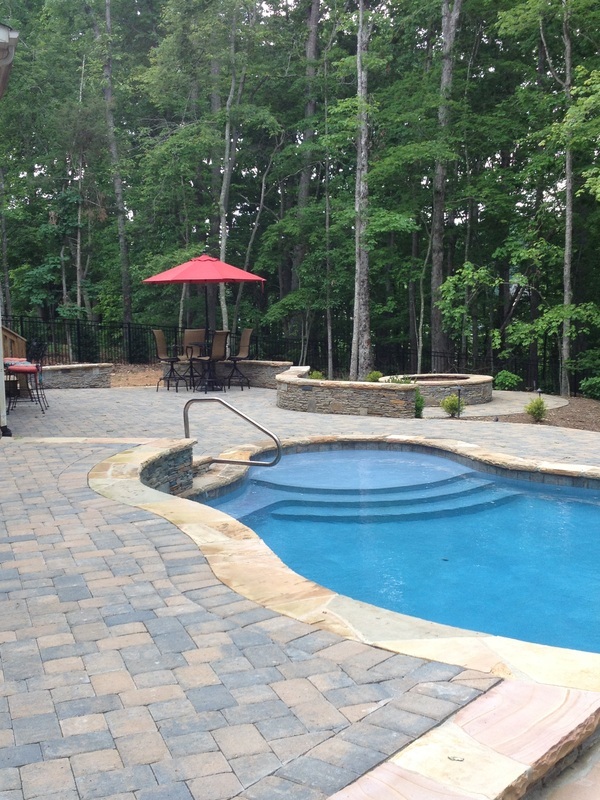 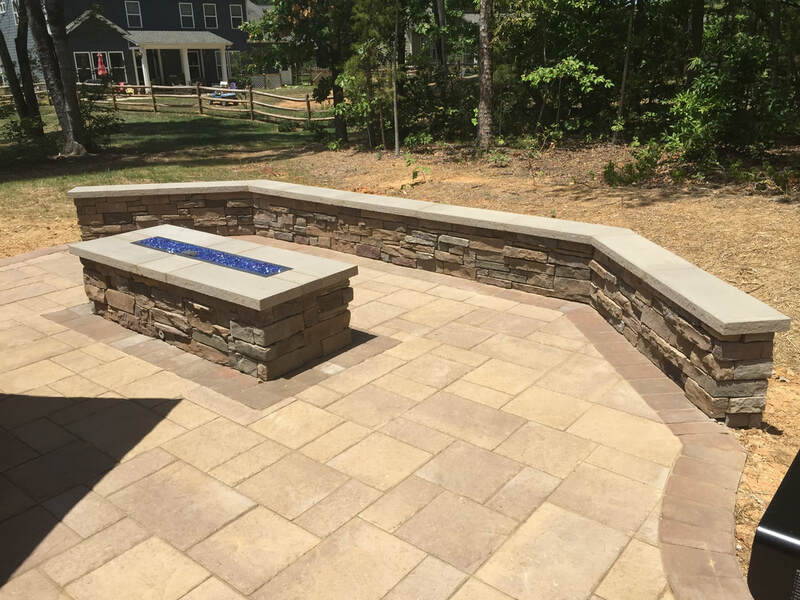 The outdoor fireplace is the focal point of this paver project in Waxhaw. 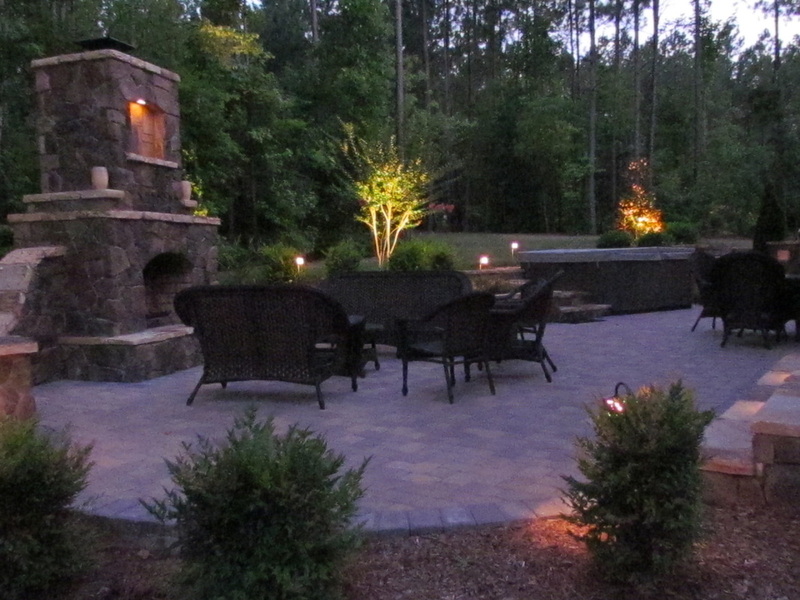 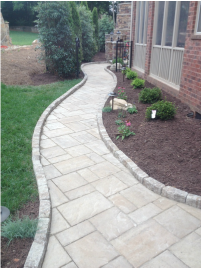 This paver patio in Waxhaw, NC shows the low voltage landscape lighting that we installed. 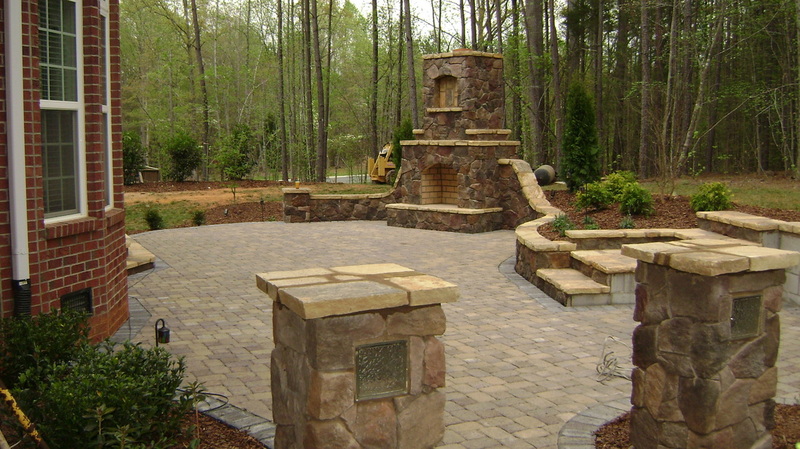 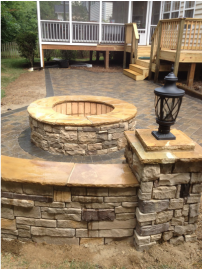 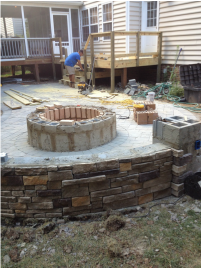 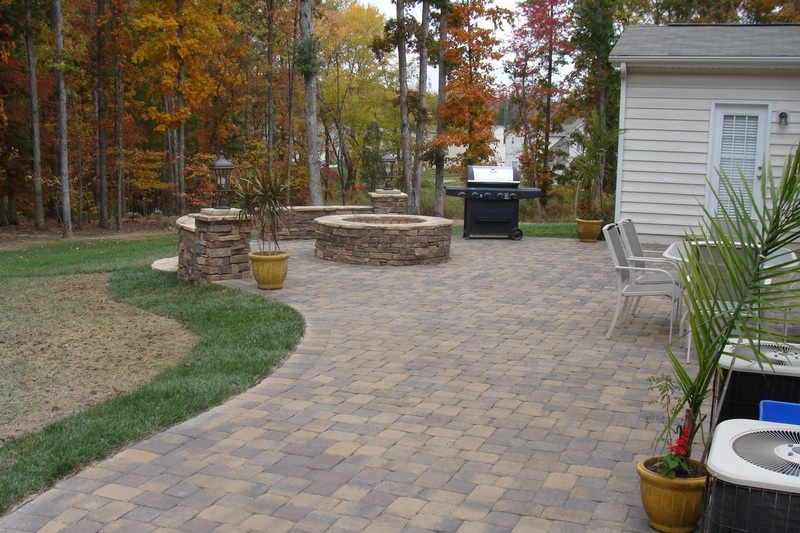 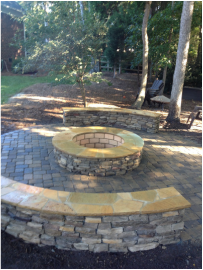 This masonry fire pit, paver patio and stone seat walls in Charlotte fits perfectly into this wooded back yard area. 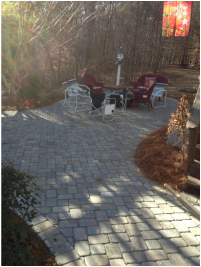 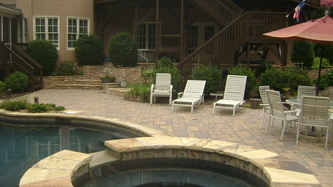 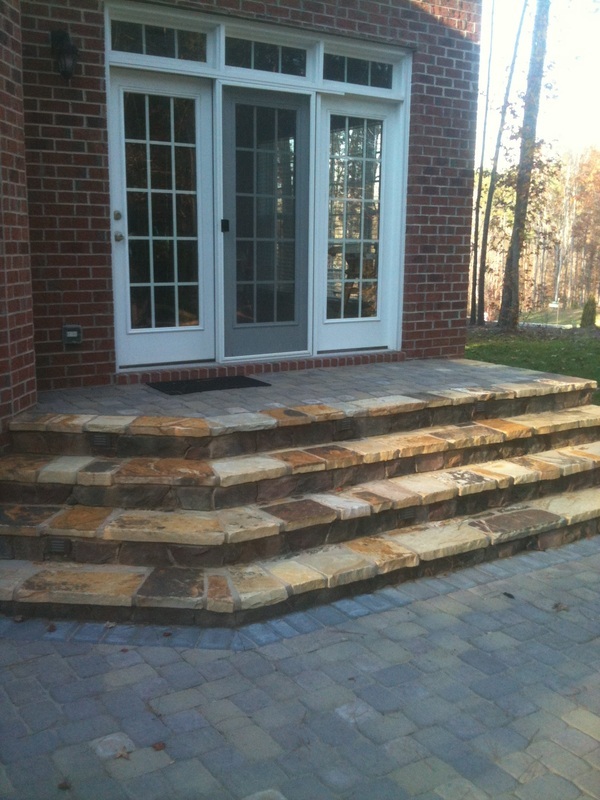 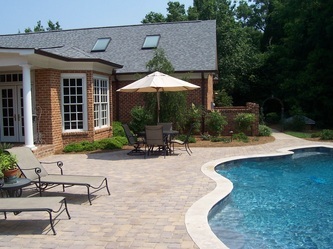 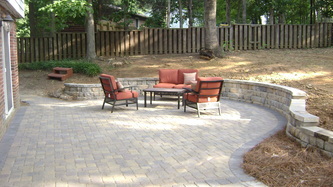 This paver patio project in the Ballantyne area included a small deck renovation in order to maximize the patio space. 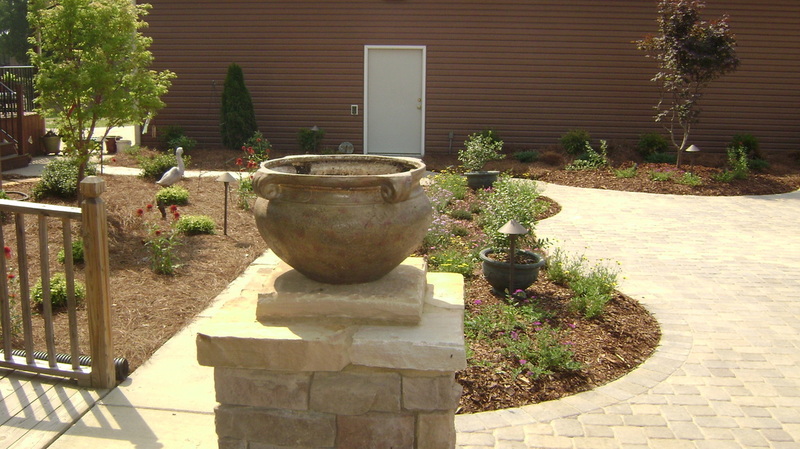 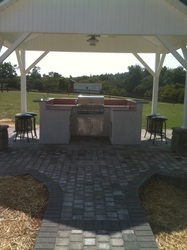 A custom fire pit and stone seat walls / columns completes the project. 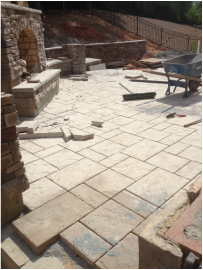 Here's a view of the previous patio while it's under construction.